The ever-after, the demonic realm that parallels our own, is shrinking, and if it disappears, so does all magic. 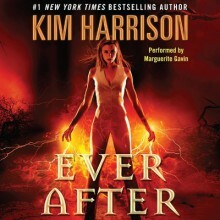 It's up to witch-turned-daywalking-demon Rachel Morgan to fix the ever-after before the fragile balance between magic users and humans falls apart. Of course, there's also the small fact that Rachel is the one who caused the ley line to rip in the first place, and her life is forfeit unless she can fix it. Not to mention the most powerful demon in the ever-after—the soul-eater Ku'Sox Sha-Ku'ru—has vowed to destroy her, and has kidnapped her friend and her goddaughter as leverage. If Rachel doesn't give herself up, they will die. Forced by circumstance, Rachel teams up with elven tycoon Trent Kalamack—a partnership fraught with dangers of the heart as well as betrayal of the soul—to return to the ever-after and rescue those she loves. One world teeters on the brink of interspecies war, the other on the brink of its very demise—and it's up to Rachel to keep them both from being destroyed. Who knew that the same man who tormented you and made you crawl would end up being a friend. And who knew I was so bloodthirsty. Bad people came back into Rachel's life and was saying out loud, "Kill him!" I liked the book up to the ending which just left me scratching my head.